A ransomware crypto-virus that goes by the name of MotoxLocker was discovered by researchers from the MalwareHunterTeam. They claim that the virus is a new variant of the DetoxCrypto ransomware and that it uses the AES algorithm for encryption. Locked files do not get a new extension, and the ransom note is written in Croatian. To see how to remove this ransomware and how you can try to decrypt your files, read the article to the end. Short Description The ransomware will encrypt your files with AES encryption, without adding new extensions to them. Symptoms The ransomware will display a ransom note in Croatian and ask around 50 euros for decryption. User Experience Join Our Forum to Discuss MotoxLocker. MotoxLocker ransomware probably uses similar ways of spreading itself like its past variants, such as the DetoxCrypto virus. Spam email campaigns are distributing the payload file of the ransomware. Such an email will try to convince you that an important message is conveyed in the attached file that comes with the email. In fact, the attached file will look like a normal document, but the malicious payload of the virus will be contained inside the very same file. If you open the contents, deem your computer machine infected and your data encrypted. Other infection methods for MotoxLocker could be set in motion, which utilize social media networks or file sharing services. The malware creator could have put the malicious files on any such platform, as an additional way for infection. Be careful when browsing the Web and avoid dubious e-mails, files or links. Perform checks of any file you have downloaded for its signatures, size, and perform a scan with security software. You should read more ransomware prevention tips in that forum thread. When the MotoxLocker ransomware virus drops its payload file, it probably creates entries in the Windows Registry, for retaining persistence. Those entries will set the malware to launch automatically with every boot of the Windows Operating System. From then on your files get encrypted. After all of your files become encrypted, the virus creates the file which contains the ransom message. The ransom note is written entirely in Croatian and describes the payment instructions. NAPOMENA: Nemojte brisati ovaj program jer će biti potreban da bi vratili fajlove. 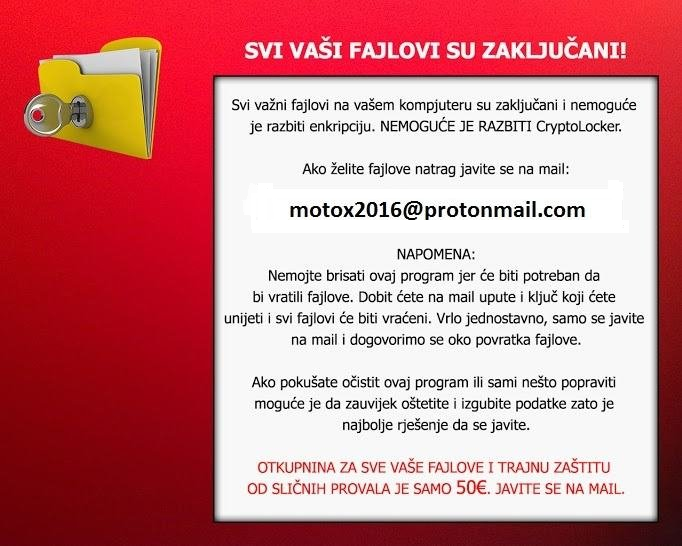 Dobit ćete na mail upute i ključ koji ćete unijeti i svi fajlovi će biti vraćeni. Vrlo jednostavno, samo se javite na mail i dogovorimo se oko povratka fajlove. Ako pokušate očistit ovaj program ili sami nešto popraviti moguće je da zauvijek oštetite i izgubite podatke zato je najbolje rješenje da se javite. OTKUPNINA ZA SVE VAŠE FAJLOVE I TRAJNU ZAŠTITU OD SLIČNIH PROVALA JE SAMO 50€. JAVITE SE NA MAIL. NOTE: Do not delete this program because it will be needed to restore the files. You will receive instructions in the mail and the key you enter all the files will be restored. Very simple, just contact us at mail and arrange for the return of files. If you attempt to clean this program or yourself something to fix it is possible for all damage and loss of data because it is the best solution to contact. RANSOM FOR ALL YOUR FILES and permanent protection of a similar break-in was only 50 €. CONTACT THE EMAIL. The MotoxLocker ransomware sets a decryption price of 50 euros, which is not a lot, but you shouldn’t be tempted to pay under any circumstances. No guarantee exists that you will recover your files. The cybercriminals will just use the money to make a new ransomware and possibly put some of the money aside for other criminal activities. The email used as a contact is [email protected]. ProtonMail is an encrypted electronic mailing service that is used by other ransomware viruses, such as the new variant of Fantom ransomware, which does not seem related to this cryptovirus. The encrypted files will not have any new extensions, prefixes or name changes, whatsoever. The ransomware uses the military AES encryption algorithm and encrypted files will have a bigger size. The malware researcher Michael Gillespie has stated that the ransomware is decryptable. Check below for a possible decryption of your data. The MotoxLocker ransomware is highly likely to erase all Shadow Volume Copies from the Windows Operating System. Continue to read and see how you can try to decrypt some of not all of your files and turn them back to normal. If your computer got infected with the MotoxLocker ransomware virus, you should have some experience in removing malware. You should get rid of this ransomware as fast as possible before it can have the chance to spread further and infect more computers. You should remove the ransomware and follow the step-by-step instructions guide given below. To see ways that you can try to recover your data, see the step titled 2. Restore files encrypted by MotoxLocker. Threats such as MotoxLocker may be persistent. They tend to re-appear if not fully deleted. A malware removal tool like Combo Cleaner will help you to remove malicious programs, saving you the time and the struggle of tracking down numerous malicious files. Threats such as MotoxLocker may be persistent on your system. They tend to re-appear if not fully deleted. A malware removal tool like SpyHunter will help you to remove malicious programs, saving you the time and the struggle of tracking down numerous malicious files. Note! Your computer system may be affected by MotoxLocker and other threats. SpyHunter is a powerful malware removal tool designed to help users with in-depth system security analysis, detection and removal of threats such as MotoxLocker. 1. Install SpyHunter to scan for MotoxLocker and remove them. 2. Scan with SpyHunter, Detect and Remove MotoxLocker. Ransomware infections and MotoxLocker aim to encrypt your files using an encryption algorithm which may be very difficult to decrypt. This is why we have suggested several alternative methods that may help you go around direct decryption and try to restore your files. Bear in mind that these methods may not be 100% effective but may also help you a little or a lot in different situations. Note! Your computer system may be affected by MotoxLocker or other threats. Remove MotoxLocker by cleaning your Browser and Registry. Fix registry entries created by MotoxLocker on your PC. Combo Cleaner is a powerful malware removal tool designed to help users with in-depth system security analysis, detection and removal of threats such as MotoxLocker. Step 5: In the Applications menu, look for any suspicious app or an app with a name, similar or identical to MotoxLocker. If you find it, right-click on the app and select “Move to Trash”. Step 6: Select Accounts, after which click on the Login Items preference. Your Mac will then show you a list of items that start automatically when you log in. Look for any suspicious apps identical or similar to MotoxLocker. Check the app you want to stop from running automatically and then select on the Minus (“–“) icon to hide it. Remove MotoxLocker – related extensions from your Mac’s browsers. A pop-up window will appear asking for confirmation to uninstall the extension. Select ‘Uninstall’ again, and the MotoxLocker will be removed. When you are facing problems on your Mac as a result of unwanted scripts and programs such as MotoxLocker, the recommended way of eliminating the threat is by using an anti-malware program. Combo Cleaner offers advanced security features along with other modules that will improve your Mac’s security and protect it in the future. Hey !, I found this information for you: "MotoxLocker Virus – Remove and Restore Your Files". Here is the website link: https://sensorstechforum.com/motoxlocker-virus-remove-restore-files/. Thank you.